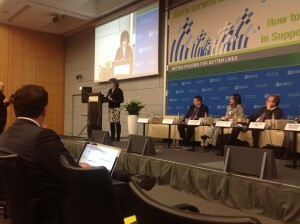 USCIB’s Norine Kennedy (pictured on the left at podium), attended the OECD Green Growth and Sustainable Development Forum on December 5 – 6 in Paris, representing the Business and Industry Advisory Committee to the OECD (BIAC). Speaking in a panel on “Unlocking Private Sector Investment in Green Growth,” Kennedy highlighted the importance of providing enabling frameworks and policies that work in synergy with trade and investment rules. “Policies to green economic activity have to emphasize multilateral approaches, and function in globalized markets to enable business to deliver the full potential of innovation and economic prosperity,” stated Kennedy. The BIAC delegation also updated the GGSD Forum on the International Business Green Economies Dialogue (GED) initiative, indicating its ongoing work to provide business views and foster thoughtful discussion of how to design greener economic policy approaches into the UN Post 2015 Development Agenda and SDGs. Dr. Brian Flannery, Chair of the GED, led a GGSD Forum discussion on supporting investment in clean energy infrastructure, in which both government and private sector speakers considered the synergies between public-private sector partnerships, overseas development assistance and regulatory and market signals. The overarching theme of this year’s GGSD Forum is encouraging and leveraging private investment for green infrastructure and technologies, including innovation policies. BIAC has worked with the OECD Green Growth project since it’s inception, engaging on the broad range of themes that this horizontal program encompasses, such as green taxes, green jobs, green procurement and green technologies.